Cracked Energy – more than your average pre-workout? 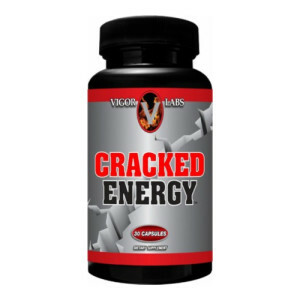 Cracked Energy by Vigor Labs says it’s not your standard pre-workout supplement. No siree. This formula claims to support energy, strength concentration and focus throughout the day, enabling you to get you through more in the gym and beyond. What’s more, it promises to unleash a torrent of energy within just 15 minutes – all without side effects and an easy-to use pill form. But does it deliver in reality? We put Cracked Energy under the microscope. What’s in Vigor Labs Cracked Energy’s Formula? Amounts are per serve, however it isn’t disclosed how much of each ingredient is in the proprietary blend. This means it’s difficult to know if the ingredients are used in high enough quantities to be effective. Take one capsule 15 minutes before you need an energy boost. The manufacturer doesn’t state, however, if there is a maximum dosage per day. Unsurprisingly, there’s no shortage of positive testimonials on the manufacturer’s website, however we can’t find any independent user reviews of this product. The jury’s out. You can buy Cracked Energy straight from the manufacturer at Vigorlabs.com, where a tub of 30 capsules will set you back $19.95. You can also find this supplement at Bodybuilding.com, Vitacost.com, Luckyvitamin.com and Maxnutritionshop.com. Vigor Labs do accept returns, but only on unopened items – so let’s hope you’re happy with the results! pretty uninspiring really… the proprietary blend does contain a recognisable ingredients, but the fact that the makers prefer to not tell us how much of the key ingredients are in the mix raises a few eyebrows… without knowing how much of anything is in each dose,( and knowing that they are all crammed into a 500mg serving) we have no idea just how effective (or not) this could be..
Not For Us.… We prefer to know exactly what we are taking, and we know for sure that you could find better products out there..